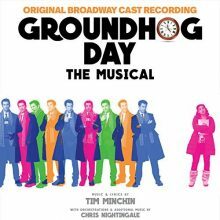 Sony Masterworks zaprasza do wysłuchania albumu Groundhog Day The Musical (Original Broadway Cast Recording). To doskanała rejestracja musicalu zatytułowanego Dzień Świstaka. Tę musicalową produkcję zrealizował brodwayowski zespół w składzie: Rebecca Faulkenberry, John Sanders, Andrew Call, Raymond J. Lee, Heather Ayers, Kevin Bernard, Gerard Canonico, Rheaume Crenshaw, Michael Fatica, Katy Geraghty, Camden Gonzales, Jordan Grubb, Taylor Iman Jones, Tari Kelly, Josh Lamon, Joseph Medeiros, Sean Montgomery, William Parry, Jenna Rubaii, Vishal Vaidya, Travis Waldschmidt i Natalie Wisdom.